Fashionably attired young man kissing a lady – Histoire de Helayne; 15th century French (1460-65). Bibliotheque Royale, Brussels. This session (#508) was one of several at Leeds devoted to exploring childhood in the Middle Ages. Our presenters talked about the stereotypes of adolescence, and what the coroner’s rolls revealed about the deaths (and lives) of medieval children. Our first speaker was Emily Rozier (University of Birmingham), whose area of study is late medieval literature. In her paper, Stop Playing the Galaunt: The Reunification of Youth in 15th Century England, she looked at what medieval texts can tell us about late medieval attitudes to male youth. Rozier read out a snippet from the Acts of the Courts of Mercers’ Company (1479), where one ‘Robert Careswell’ was accused of acting ‘lyke a gallaunt‘ and of emulating the appearance of the galauntness’. What exactly does this mean? The etymology of the word galaunt does not stem from the word “gallant”, which has a positive, noble connotation, but rather from the French, galer “to make merry”. A ‘galaunt’ was the medieval equivalent of, ‘A man of fashion, a rake, a dandy’. The galaunt was a satirical representation of youth prevalent in late medieval England. The term ‘galaunt’ appears frequently in the 14th and 15th centuries and is the prominent detractor used against youth at the time. References to the galaunt can be found in letters, legal cases, and guild accounts. These sources acted as a warning against the excesses of the galaunt lifestyle. The figure is also commonly used as a stock vice character in medieval drama. The galaunt was well known in the Middle Ages and a popular emblem aimed at English youth. Rozier focused her paper on the 15th century advice literature that was used to warn and educate contemporary youth in this period. She was interested in the galaunt because, ‘despite the cultural significance of the late-medieval tradition, it has received little, though some excellent, scholarly attention’. Rozier cited samples from, The Book of Curtesye, Caxton’s Early English Meals and Manners, and his, The Book of the Odre of Chyualry as works that used the galaunt as a vehicle. Youth sitting in a tree wearing late 15th century fashions. Galaunts were young men, a stage in the life cycle that could range anywhere from 16 to 35 years of age (well beyond a teenage time frame). They were portrayed as a fashionable set, wearing high hats, short gowns and long toed shoes. These fashions were roundly denounced by writers of the time as being detrimental to the whole of society and a threat to the English nation. Writers accused galaunts of trying to seduce women with their outrageous attire. The galaunt was young, licentious, gluttonous, frequented taverns, and often inebriated. The galaunt was the ultimate symbol of youthful excess and was a warning of the dangers of a wayward lifestyle. Much like today, adolescence in the Middle Ages was viewed as a hedonistic period. The galaunt acted as a stereotype for satirists to be able to complain about contemporary youth and urge them towards the renunciation of this lifestyle. Just like teenagers today deal with admonitions and warnings about the follies of youth, Rozier demonstrated through the figure of the galaunt that medieval youth faced similar issues. However, Rozier warned that while the discourses written about youth offer us an indispensible look at medieval adolescence, they can’t be relied upon as completely accurate because they are third party opinions. The complaints are also part of a much older tradition of presenting youth as a time of instability and excess. Much like a modern paper today writes about adolescents from an adult perspective, these writings about wayward teens in the Middle Ages were not written by the teens themselves. We must view the information we’re presented cautiously as only one viewpoint dominates these narratives. 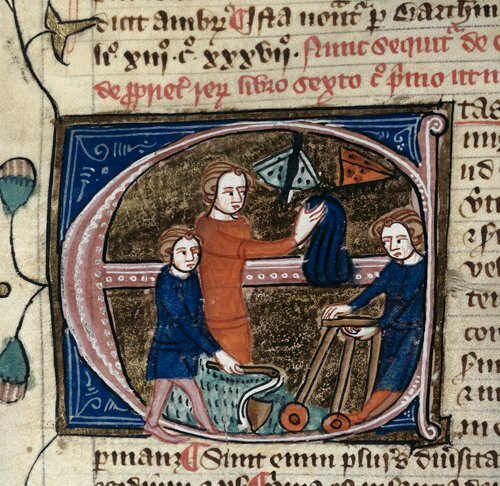 Medieval Children – Omne Bonum – Royal 6 E.VII, f.67v (det). Wiki Commons. Following the misdeeds of medieval adolescents, Janine Bryant (University of Birmingham) spoke about the hazards encountered by children in the late middle ages, and how coroner’s rolls can inform us about their lives, not just their deaths. Bryant’s paper examined the the responsibilities of the coroner and English coroner’s rolls in London, and the counties of Bedfordshire and Warwickshire between 1265-1392, to show what activities the children were engaged in at the time of their deaths. In 1194, the coroner was introduced into England. Sheriffs were over burdened, so a new position was created to work alongside the local sheriff to determine unnatural deaths and what caused them. The coroner was also responsible for ensuring that all crown pleas that arose from these deaths were presented to the justices and all financial issues were resolved. To appraise the value of goods, land and chattels – This was a lucrative source of governmental income. For example, in 1271, a 15 year old boy died in a boating accident when he fell between 2 boats and drowned. One boat was appraised at 12 pence the other boat at 3 shillings because they were deemed the cause of his drowning. Collection of fines pertaining to unlawful body removal – The body had to remain unmoved or the community would be fined – this was another profitable way of gathering revenue. Different counties had different methods for recording information making it hard to conduct accurate comparative studies. Some counties, like Warwickshire, only detail incidents where the child died while not in the parent’s care. For that reason, Bryant focused mainly on 2 areas for this study, London and Bedfordshire. Despite these challenges, the rolls are still incredibly useful for telling us how children lived, places children played, and how they died. Knight killing a child. From – The Massacre of the Innocents in a breviary, French, about 1320–25. Tempera colors, gold leaf, and ink on parchment, each page 6 9/16 x 4 3/8 in. The J. Paul Getty Museum, Ms. Ludwig IX 2, fol. 142. Children experienced violence in the Middle Ages and the coroner’s rolls show that they were certainly victims of it. In a case where a home was robbed by thieves, the children were wounded and left for dead. Bryant was quick to point out that children were not intentionally killed, they were killed along with adults in the course of a theft. She surmised that violent death in the rural areas was higher because properties were less substantial and people were isolated from their neighbours. Animals also contributed to childhood deaths. Bryant found several cases of children killed by pigs. In one instance, a sow mortally wounded a baby left in its crib. Pigs, hens and horses were all recorded as contributing to deaths of children. However, the biggest hazard for children in the Middle Ages appeared to come from water. Children were recorded in the coroner’s rolls as having drowned in wells and rivers, or scalded by hot water over the hearth. She surmised that violent death in the rural areas was higher because people were isolated from their neighbours and parents often had to work in the fields, leaving their children unattended. Children also played further away from home. Bryant also suggested that the population of London was more migratory and there may not have been as many children. Children may have been better supervised in urban areas, whereas in rural areas, adults were working further from home and on occasions left children usupervised. In urban areas, there were also more people around to intervene. Deaths via playing tended to stop at age 8, and were replaced by accidents of children at work. The majority of children who died in this manner were male, and outdoors. 80% of work related deaths were also found in rural areas.